Riding on electric cars is every child’s dream. These are one of the best gifts we can give to a child, albeit a rather expensive one. Seeing the kids’ happy faces will surely wipe out much of the cash sting. It will definitely amaze them as they would feel like they are hopping on real cars. Most importantly, it would help develop the child’s cognitive and psycho-motor skills while enhancing their self-esteem too. Looking for the best powered wheels and electric cars for kids available in the market today? You would be in awe at the features these cars boast. They have real doors, headlights and mirrors. At different types of speed, they can even be driven practically on all-terrains. Thus providing maximum enjoyment for kids. Kids can also learn driving at such an early age with any of these top 28 best electric riding cars. Give your kids the gift of get-up-and-go fun this year with the Green Dune Racer. It is an off-road power car, designed to navigate through rough terrains in your yard. Specifically, the kid’s car can run over common bumps in the yard such as tree roots, sidewalks and driveway edges. This vehicle has large, heavy-duty tires. Also, its traction system prevents it from getting stuck, whether in a lawn, wet grass, hard surfaces, mud or gravel. With a sturdy steel frame, it is able to accommodate a weight of up to 130 pounds. There are metal sidebars for hand support and two speeds to choose from to make driving more comfortable. The kids vehicle has an electronic power lock braking system. Importantly, there two speeds at 2.5 mph and 5 mph. Added to its many features are the reverse function and all rounded edges. Fisher-Price makes some of the best motorized cars for kids. This is a kid’s car made in the style of a sleek Mercedes Benz model. The car features both remote control and manual operations. The remote control allows parents to help drive the car while the kids are not ready to drive on their own. It comes with an MP3 connection which allows the driver to listen to music. Offering a very realistic operation, there is a key-start function that will get the car moving. Furthermore, there are the forward, reverse and stop gears like that of a real car. A variety of lights such as LED rear, turn, dashboard and headlights are included too. Also, it can hold a weight up to 55.1 pounds. Most importantly, it has an adjustable seat belt to give parents peace of mind about their children’s safety. Ideal for any child with a sense of adventure, this car truck is the perfect single child ride-on vehicle for anyone ages three to eight years. It can be operated in two ways: remote control or steering wheel. The remote control feature is great for younger children whose parents are not yet ready to let them take the wheel. The manual option allows older children to drive on their own for an added fun and adventure while listening to the music through the AUX cord provided. It has 14-inches traction wheels that feature spring suspension systems which allows the kids to drive over almost any surface like that with gravel, mud, grass, driveways and more. This motorized car for kids is made using a non-toxic plastic body and equipped with an adjustable seat belt for safety. The doors are magnetic and LED lights give it a more realistic appeal. Also, there are three speed options from low, medium and high, thanks to its 12-volt motor. Whether your little one hopes to one day become a police officer, patrol the streets or simply likes the idea of riding a motorcycle, this motorcycle can help make their dreams come true. It has the appearance of a real police bike. With side view mirrors as well as chrome details to make it appear more realistic. This bike is equipped with headlights, hazard lights and signal lights. The hand accelerator makes the bike move at either 2.5 miles per hour or 5 miles per hour. They can even reverse the bike. It has a weight capacity of 110 pounds, making it ideal for children of most sizes. A storage at the back allows the kids to bring their favorite toys with them. When the 12-volt battery gets low, it can be recharged using the battery charger. Give your child the thrill and excitement of driving their own big truck. This ride-on toy is designed to look just like the real thing. It has a red painted body, with the GMC logo on its detailed grill. With its ability to go in both forward and reverse directions, your child will love the control they have over this truck. Both the forward and reverse speeds clock in at a safe 2.5 miles per hour traveling speed. It features working LED lights on the tail and headlights, a horn and engine sounds to really make it more realistic. Inside, there is an MP3 connector complete with speakers. The battery life indicator will let parents know if it is time to recharge the 12-volt battery using the external side charging port. The two opening doors with windows, a clear windshield, a tailgate, side view mirrors plus its unique dashboard and chrome-plated rims complete this awesome toy truck. Combine your child’s love for Disney’s Frozen with their love for adventure. Have them explore the yard with these kids power wheels. The jeep is covered from top to bottom with the blue and white colored palette and comes with Frozen decals on its hood. It is made to look just like a Jeep Wrangler with its unique open-air style and frame. There is a pretend radio that plays all their favorite songs from the film. Give your children the adventure of a lifetime with this ride-on car. Designed to look just like a real Jeep Wrangler, it has been given a red paint job. On the hood is the Jeep logo, while the grill on the front gives it a cool appearance. Working LED lights add to the realness of this car as well. Open areas on each side are provided for them to get in and out of the vehicle in a true jeep style. It features a roomy back storage for kids to put their favorite toys while driving. The jeep goes anywhere between 2.5 and 5 miles per hour at the most when going forward and goes only a safe 2.5 miles per hour when in reverse. In addition, this power wheels can drive on both grass and hard surfaces without any issue, thanks to its rugged, heavy duty tires. Playing with it, encourages children to understand cause and effect as they learn how to make it go forward and backwards. It has a room for two kids with a weight capacity of 130 pounds. Let your child experience the fun and adventure that comes with riding an ATV in a safe and kid-friendly way. It can accommodate children of most ages and sizes with its large weight capacity. This ATV is ASTM-certified and is made out of an ultra durable, hard plastic body. The built-in, bright LED headlight can be turned on with a simple push of a button. Hand acceleration makes it even more realistic. It is simple to change directions with its forward and backward driving capabilities. The tires are rugged and are can go over most terrains that your yard has to offer. Likewise, this motorized car for kids can be easily charged with inclusion of a charger and a rechargeable 12-volt battery. Show your child the fun they can have when they drive around in a luxury vehicle built just for them. This ride-on car is made to look just like the BMW i8, with its polished white exterior and its sleek design. It even included the BMW emblem on the hood to make it appear more like the real deal. In front of it, there are two real-working headlights. This kids car can go forward and backward so that your child is in total control over the way the car moves as fast as 2.5 miles per hour speed. Furthermore, it has an interior detail that makes it look like a true BMW. While driving and they want to listen to music, there is an MP3 cord and a loudspeaker available. Also, it has a rechargeable 6- volt battery that can be charged any time. All the fun can be experienced by your children with this realistic ride – on car. It is a single-seater, your little one can enjoy. Equipped with a remote control, for parents to help when the child is too young to drive on his own. Made to look and feel like a real car, it comes with a horn and real engine sounds. It has a seat belt for the child’s safety. There is a gear switch inside of it, while on the outside, there are LED lights. The car can be driven in two different speeds of 2.5 – 5 miles per hour. Included in this car is an AUX cord that allows them to play their own music or they can simply play the preset tunes. Lastly, it has a weight capacity of 66 pounds. Sleek, black and made to look like a real Lamborghini, this will have your little one driving around in style. This battery-powered car that has a room for two and is ideal for kids ages 2 -4 years. It can be controlled by the parents using the included accessory or the child can take control of the wheel. When the child is ready to drive on their own, the foot pedal and the steering wheel can be used in harmony. The two 12-volts, rear-drive motors give this car its get-up-and-go plus the reverse capability, while the battery can be easily recharged. Three different speed settings within 2 – 4 mph are available in this powered wheels. Let your children experience the thrill of a sports car in a child friendly way with the help of this convertible car. It is a red-painted ride-on toy that is meant to look just like real one together with its open top and spacious seat. A maximum weight of 65 pounds makes it ideal for children of almost any age. Part of its realistic features include a BMW logo on the hood and a grill at the front. This car can move forward and backward with ease. The motions can be done with the help of the pedal for the acceleration. Addition to its many features are the dashboard in the interior, a horn and headlights and of course, a seat – belt for the child’s safety. Also, there is a gas cap on the side, which is where you charge the battery which only takes around nine hours to charge it up for an hour of driving fun. Want to take your child’s adventure to a whole new level? This ride-on car is perfect in which it can accommodate most children between the ages of three to eight years old with a maximum weight of 65 pounds. It can be operated by a child through a pedal and a steering wheel. But, if the child cannot drive on his own yet, parents can help by using a remote control. With its 14-inch traction, great grip and spring suspension system together with a seat – belt, taking on any surface is an easy task. Inside of the cab, there is a gearshift for moving forward or backward. Likewise, magnetic doors are provided and LED lights for a more realistic appeal. Plugging the kids blend of music is not a problem through the aux cord or they can simply enjoy the preset tunes. Your little one can ride in style over any terrain in your yard with this toy car.It is made to resemble a red Mercedes-Benz which certainly looks the part. A stylish red painted body and lights in front and at the back plus a functioning horn show off its realistic features. Inside, your child can listen to the preset music or turn on the FM radio to be set to their liking and also the volume controls. This car comes with two 12-volt motors that allow them to enjoy three different speeds, including two, three and four miles per hour. It has a remote control and a standard acceleration pedal. The parent can control the car using the remote, until the child feels confident to drive it. Give your kids the control they want over their next big adventure with this toy truck. It comes with a remote control for parents to use when the child is not yet ready to drive on his own. Ideally, it can be ridden by kids ages two and four years. This car has an off-road style appearance with a red finishing on its plastic body. Inside, it has upgraded leather seats for a luxurious look and functional front LED lights. The kids can enjoy driving while listening to an FM radio, an MP3 player or the standard music in the car. It has SD card-connectivity as well. This truck has three different speed settings which include 2 – 4 miles per hour. Likewise, it has a reverse feature, making driving it easier. Let your little one have free range of the yard with this powered wheels. It is made to look like the Jaguar vehicle and is sure to be the envy of other kids. This sleek black car is elegant inside and out. It has a real leather interior that is sure to add luxury to the ride. Your kids can be in control of the music through the FM radio or have their own brand of music using the SD or USB MP3 player. There are three different speed settings of a 2 – 4 miles per hour limit plus a reverse feature. Parents can operate this car using the included remote control until the child is ready to take on the challenge by using the foot pedal and steering wheel to move about the yard on their own. The tires are made out of durable EVA and foam rubber material. Every bit is as sleek and elegant as the real deal! This car is ideal for children between the ages of two to five years. Moreover, it is a limited edition toy car that features an electronic soft start while the braking system is designed to slow the car down at a comfortable pace. The LED featured wheels truly make this car stand out. There are functional headlights and taillights for a more realistic appeal. A trunk is designed for children to put in their favorite toys while driving. A long – range remote control is included for parents to help their kids who cannot drive it yet. But for older kids, they can drive it by using the pedal and steering wheel system. Also, it comes with a rechargeable 12-volt battery that recharges to full power in no time. 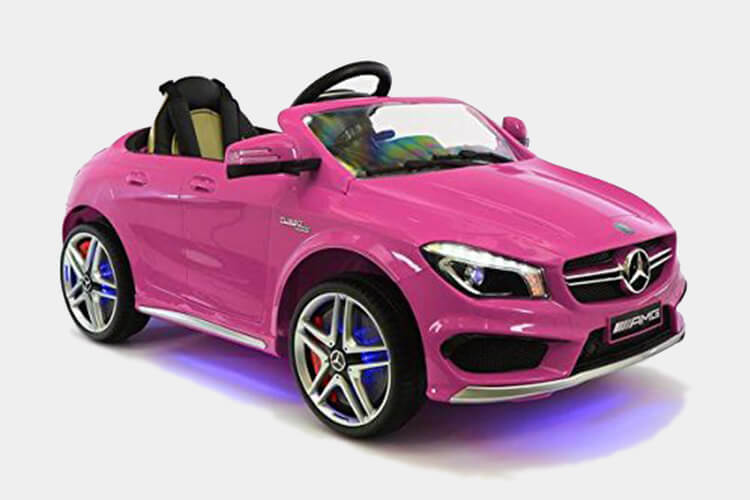 Put a modern spin on the classic term ‘Barbie car’ and get your little one a hot pink dream car. This ride – on car is made to look just like a Mercedes and is a licensed product. It is a 2017 limited edition model, comes with all exterior decorations that signify its luxurious nature and made to look as a realistic as possible. Among its high -end features include LED lights on the wheels and functioning headlights and taillights. Also, the dashboard with working gauges and an electronic soft start and braking mechanism to ensure a smooth ride. It has doors that open and close as well as storage space in the trunk for the kids’ favorite toys to bring with them. The kids can listen to the music, thanks to the integration of an MP3 player and speaker inside of the unit. The leather seats are made from soft PU complete with a 5-point safety harness. Give your children their dream car before they have the chance to drive the real thing with this ride – on car. Designed to allow young children to drive around the yard with ease. This car is built to look like a real Porsche both inside and outside with its sleek exterior and its ultra comfortable, soft PU leather seats. For safety reason, a five-point safety harness is included. Children and parents can decide together how the toy is to be enjoyed. This is due to the inclusion of a long-range remote control that comes the unit. Parents can control the car from a distance or the child can use the steering wheel and pedal to control the car alone. It has LED wheels that light up as the child drives for a bit of flair and fully functional headlights and taillights. The doors open and close allowing easy entry and exit while the kid can go between two different speed settings because of the two motors it has. Let your children’s imagination run wild with this toy car. It is ideal for kids ages one to five years old. The car is built to look like a real Mercedes and is sleek and curvaceous. The genuine leather seats are soft and comfortable. Attached to the seat is a five-point safety harness that will keep your little one in place no matter how long they want to ride. It has a built-in TV for the kids to watch when they are not driving. Music can also to be played through the TV as well. This power rider has UV Lights and two different speed settings of two and five miles per hour. You can choose to use the included remote control to drive your kids from a distance or allow them to take the wheel and use the gas pedal to drive and steer themselves. This car comes with working front and rear LED lights for a touch of realism. It also comes with different sound effects. Lastly, there is a trunk space so that your children can bring all their favorite toys. Sleek and stylish, this unit is intended to look just like a real Mercedes. This car is red in color and features the Mercedes emblem on its front. The doors open and close to help the child get in and out safely. The licensed car is a 2018 limited edition piece and is suitable for one passenger between the ages of two and five. Parents can drive the child around using a long-range remote control or the child can take charge and drive himself using a combination of the steering wheel and the acceleration pedal. Inside it is a soft PU leather-lined bucket seat to further its luxurious feel and a five-point safety harness for safety. It comes with a soft start and a brake system to ensure a smooth and a safe ride. With the MP3 system inside, the child can listen to his favorite songs while driving. Also, there are horn and engine sounds that offer a more realistic feel. On the other hand, a 12-volt battery recharges fast and the tires are made out of durable EVA foam rubber. Play along with your kids or watch them as they drive through the front yard on their own. This one-person ride-on car is a Mercedes AMG-licensed toy that is built to look just like a real thing. The car features sleek black curves and is dark in color, showing off an elegant look. It has realistic front and rear lights, a horn and engine sounds. Inside, there are tunes that are preset for them to listen to or they can simply use the FM radio of the car. Parents can control the car from a distance through remote control or the child can take charge by steering the car and pressing on the acceleration pedal. It comes in three different speed settings. The car has the ability to go both forwards and backward depending on the kids’ preference. Also, an adjustable seat-belt is provided for safety purpose. Turn your front yard into a fun escape for your child with this toy car. With its unique curves and shapes, it is really meant to like a real Land Rover. This white, one-person ride-on car with an open top features a comfortable bucket seat and a seat – belt for a safe and a comfortable ride. It can be operated by using a remote control or manually. This ride – on car offers a genuine driving experience, thanks to its two different speed modes. Besides, the capability to move forward or backward, it also has an MP3 connection for listening to favorite tunes while driving. Let your kids race around the yard in classic style with this car. It features a style of a vintage car. This is an officially licensed Shelby Cobra car as with the letters on the windshield. For durability, it is made using chrome body parts. Helping to make it appear more realistic, true car racing sounds were included. Depending on the kids’ preference, there are two speed settings in this car. These speeds include 2.5 miles per hour and five miles per hour. Also, this ride – on car can accommodate a child up to a weight of 66 pounds. Your child can be the king of the road when you bring home this kid – sized power rider. It is a red ride-on car that comes with the Audi logo rings and the classic Audi grill on the front. This officially licensed and branded Audi product is a 1 to 4 scale of the real product, offering a real look and feel that cannot be beaten.Similarly, it comes with realistic car sound effects. Parents can choose to drive the car from a distance via a remote control. Likewise, it can be driven by the kids by taking on the steering wheel and stepping on the pedal. The kids will be able to listen to any music due to the inclusion of an MP3 port, connected to a stereo sound system. Lastly, the car has durable tires that can drive through different surfaces, be it rough or smooth. Your little ones can have their own off-road adventures in your own yard with this 2 – seater car. The maximum weight capacity of these vehicle measures about 130 pounds. Also, it can run for around 50 to 60 minutes at a time without needing to recharge, providing your children with all the time they want enjoying the car ride. In addition, it has a 12-volt motor, which ensures the power it needs to move throughout the day. This vehicle is driven at speeds of either 2.5 miles per hour or 5 miles per hour. While the car uses a lead battery, it charges up in no time at all. Also, it has functioning LED lights and a dashboard that rivals that of a real car. There are a number of sound effects included in this car for a more realistic adventures around the yard. Give your children the thrill of driving a powerful vehicle with kid-sized, 2 – seater car. It features the image of a Hummer H2 in all its glory. Another, is that it has a grill on the front that is reminiscent of an actual hummer as well as two handles on the back of the seats. With its four durable wheels, it can drive through from gravel to grass to pavement and beyond. It is made of a heavy-duty shell that is sure to last a long time. Also, the grill and hubcaps are both made of real chrome. There are two speed settings of either 2.5 miles per hour or five miles per hour going forward and at the same time, when they want to go in reverse, they can do so as quickly as 2.5 miles per hour. This ride-on car is equipped with a 12-volt rechargeable battery. Your children and their friends can go along for the ride SUV style vehicle. No wonder, it is an ultra large toy that features two seats in front and two seats at the back. This toy car is intended to look like a large luxury SUV with its brilliant red color and massive front. In addition to its appearance, there are shaded windows on each of the doors as well as a windshield. While the doors open and close in a natural manner, the front lights are real for a more authentic appeal. Furthermore, it has a built – in MP3 player, engine and horn sounds to help engage the child’s imaginative play. Lastly, the vehicle has a 12-volt battery that can be recharged for a short period, but plenty of play time.